← Well, it’s a marvelous night for a moondance! Today was a very long day to say the least! I had to be up and at the bus stop at 5 a.m. The walk isn’t too bad but it takes about 15 minutes. In the mix of trying to get ready and out the door I left my eye mask, pillow and blanket for the bus. I can tell you that I will never forget that again! 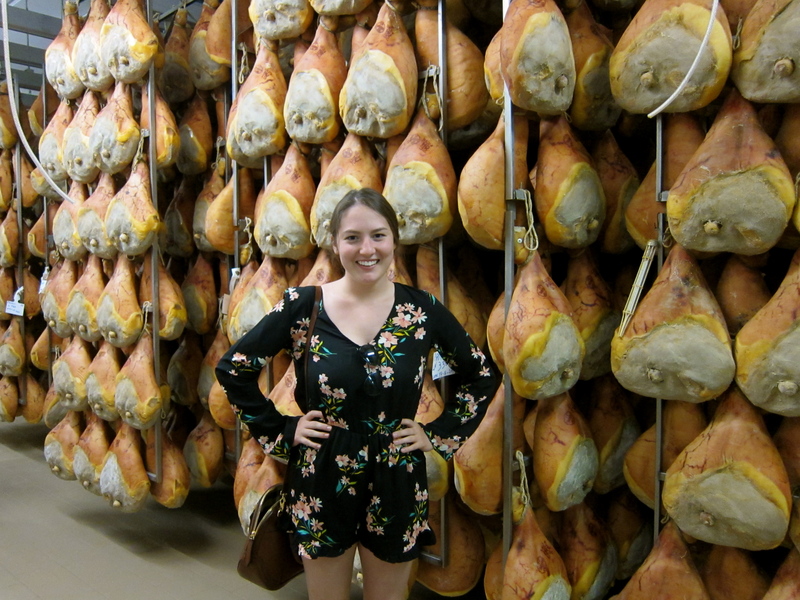 It took us about three hours to get to Parma where we visited a parmigiano reggianno farm and a farm that produced prosciutto! Our first stop was the cheese farm where we were greeted by the cheese master, Silvia. 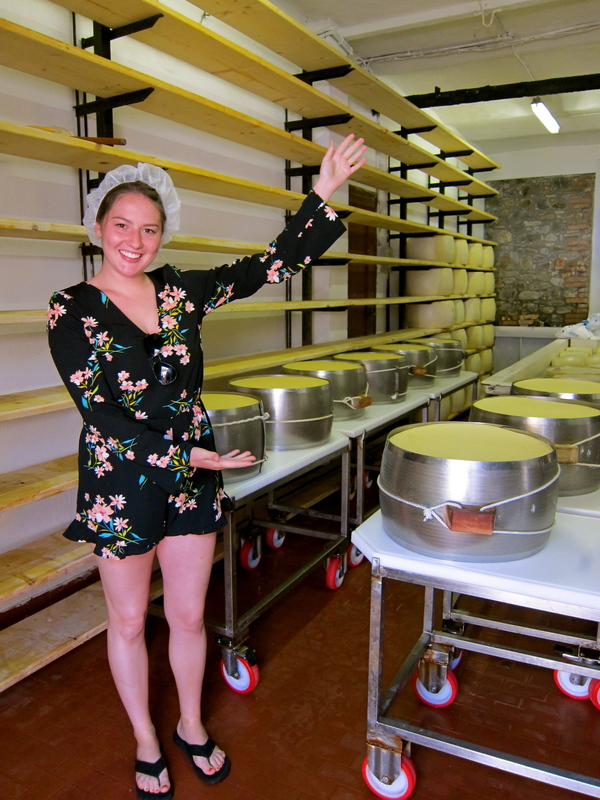 Her family has been cheese masters for over three generations. To become a cheese master you learn more from experience than you do a textbook. The way DOP parm. cheese is made is by all ingredients coming from the region where it is produced. Italy has four certified DOP regions which Parma and Modena are two of the four. 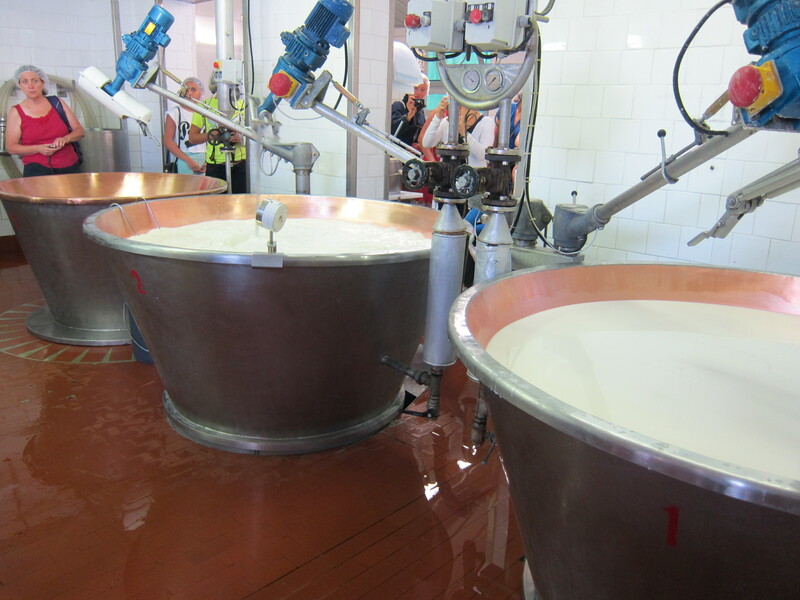 The process starts with part skim milk that is taken from milking the cows at night and letting it sit throughout the night in order for it to naturally separate. Next, they milk the cows in the morning to get the whole milk. Then they combine both milks in copper tub type things. Then they heat the milk until it is curdled and they whisk that around with a spino. After that is pulled from the copper tub and is put into a plastic mold for 24 hours. After that it is placed in a metal mold with a sort of ream of plastic that has a tag of the farm and the products name on it. Once it has sat there for 24 hours it is sat into a pool of water and sea salt for two weeks. Finally once it has been cured in a sense it is placed on a shelf for a minimum of two years. That would be considered fresh. Usually the Italians prefer 24-36 month old cheese. I mentioned earlier that in order to be DOP all products have to be produced from the region that are used. 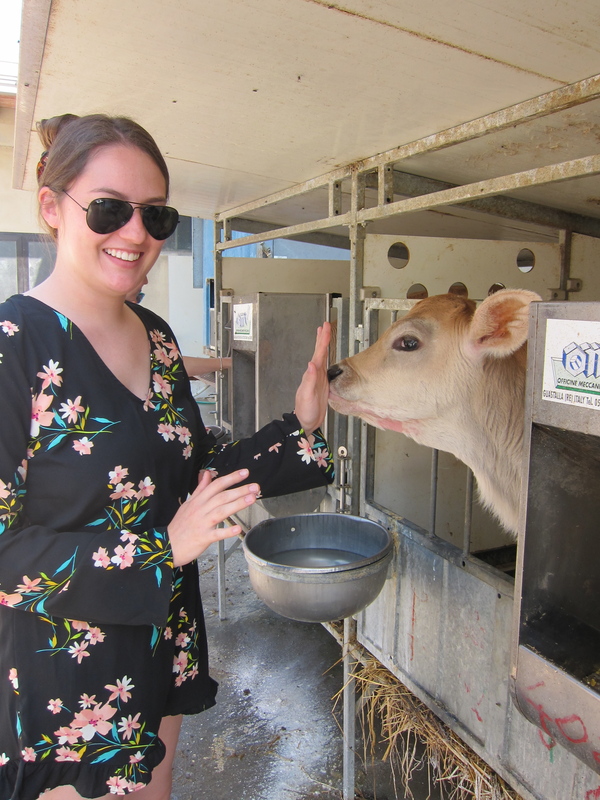 This includes the cows so Silvia took us to her family’s farm where the cows were located. I should have mentioned this earlier that it is a big deal for Silvia to be a cheese master. Usually the males in the family are cheese masters. However her brothers maintain the cows and such. After I became a cheese master myself it was off to the pig farm. We were greeted by a man named Carlos who did not speak a lick of english. His family’s farm is one of only 160 farms in Italy that produce GOP prosciutto. All members of his family are involved in the production of the prosciutto. I have learned that pretty much all farm type trades are usually passed down through generations. Anyways, so the use the back legs of the pig to make prosciutto. It is passed around through four different types of freezers for a minimum of two months. After this process it is put in a warehouse type place and hangs for 14 months. Carlos and his family at the time of our visit had 56,000 hams hanging all around us. I can tell you that I have never smelled a more pungent salt room in my life. Once we finished with the tour, Carlos invited us to his family’s caffe for some lunch. Now, I consider myself to be a trooper but after smelling the ham and seeing it all, I had to take a break on the ham. Lunch was pretty awesome and I ended up eating myself into what seemed like a vegetative state. My teacher told me that I may want to go walk around before I got on the bus. This is probably one of the more lower points in my life. So I walked outside and I saw four para-sailors going down the valley. I can’t help but say that I instantly wanted to do it. My teacher told me that Parma was the perfect place for it because there are so many valleys that it is easy to just jump off and cruise on down. After I regained my composure we were off to Modena to see how real balsamic vinegar is made. We arrived and were greeted by a woman named Paula. She and her family have been in the vinegar business for FIVE generations. Isn’t that nuts? Anyways, she took us upstairs to the attic where the vinegar was sitting. For a balsamic vinegar to be DOP certified it cannot have any additives therefore the only thing they put into their vinegar is white and red grapes. These grapes are grown in Modena and are cooked for two days. Then they are placed in five different barrels made of different types of wood. She said they never throw away these barrels because of the taste they can produce. Her oldest barrel is from 1882 and is worth 70,000 euro. Once the vinegar is placed in the barrels they sit up there for 12 to 25 years. 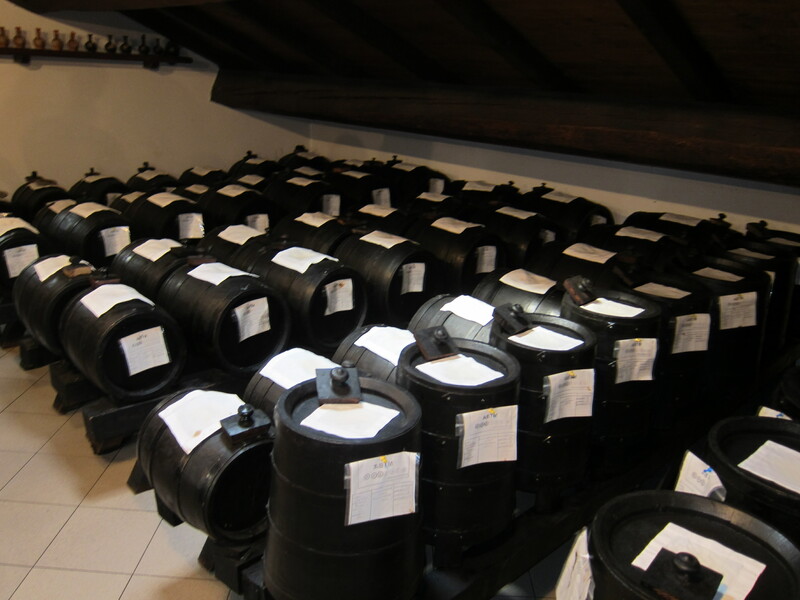 The minimum is 12 years for it to be “tradizionale” balsamic vinegar from Modena. Each bottle that is produced and is certified from here is given an individual number given by the government after production. After she explained everything to us it was time for a tasting of all of the vinegars she produces. I ended up getting the white grape aged five years because it was the twangy/sweetest. I also grabbed the balsamic with sapphron which you can put on omelets and things. In sum, I basically learned two things from my trip. 1. Know your limits on your eating abilities and 2. 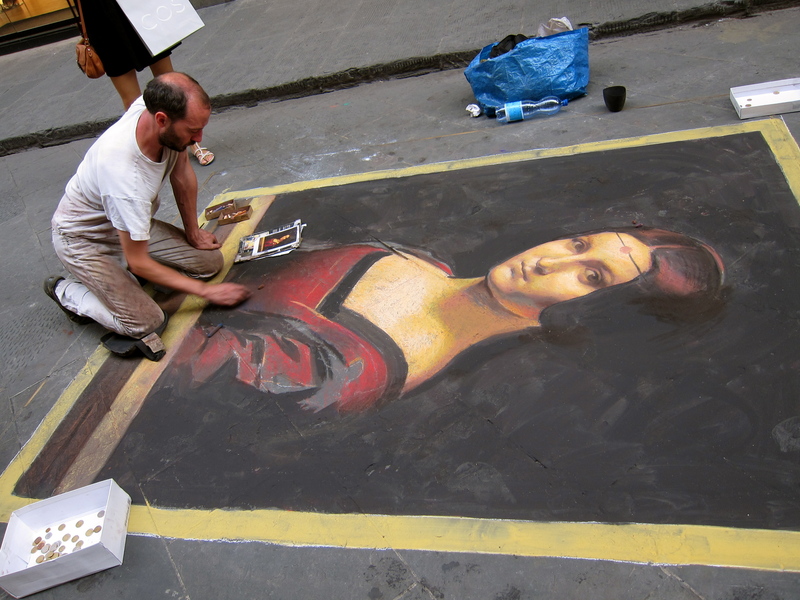 Italy produces some of the greatest products and takes great pride in making sure they are up to par. This entry literally made me laugh out loud! I am so glad you are having such wonderful and unique experiences! More importantly that you are sharing them with us! Love you, Wesley! Love you, Ms. Patricia! It’s been a great experience for sure. I can’t wait to catch up when I get back!